Looking for Blackberry Facts and Picking Tips in 2019? Scroll down this page and follow the links. And if you bring home some fruit or vegetables and want to can, freeze, make jam, salsa or pickles, see this page for simple, reliable, illustrated canning, freezing or preserving directions. There are plenty of other related resources, click on the resources dropdown above. 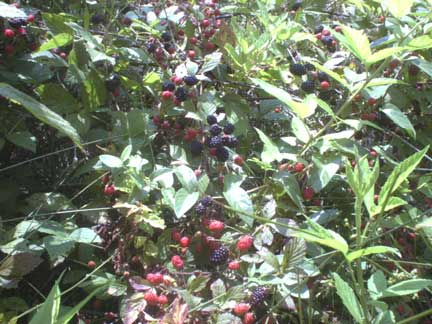 In the U.S. Blackberries typically peak during June in the South, and in July in the North. Crops are ready at various times of the month depending on which part of the state you are located. In order to produce good local Blackberries, producers depend on ideal spring and early summer weather conditions. See this page for a list of blackberry festivals around the U.S.
Black Raspberries, also known as "black caps" are a very healthy food; packed with anthocyanins! The USDA says 1 cup of blackberries has about 62 calories. 1 cup of blackberries, not packed down weighs about 140 grams. Select plump, firm, fully black berries. Unripe berries will not ripen once picked. Blackberries were enjoyed by the ancient Greeks, who believed them to be a cure for diseases of the mouth and throat, as well as a preventative against many ailments, including gout. The blackberry leaf was also used as an early hair dye, having been recommended by Culpeper, the English herbalist, to be boiled in a lye solution in order to "maketh the hair black". Researchers have known for quite some time that berries contain antioxidants which help to fight cancer causing free radicals. A study at the University of Ohio has found that black berries are the most potent cancer fighting berries of them all, by nearly 40 percent! U-pick Blackberry farms typically sell berries by the pound. A quart equals 1 and 1/2 pounds of fresh berries. Do the math and be careful not to over-purchase as Blackberries quickly mold when left at room temperature, and only last a couple of days in the refrigerator. Want to go to a blackberry festival? See this page for a list! Most growers furnish picking containers designed for Blackberries, but they may charge you for them; be sure to call before you go to see if you need to bring containers. If you use your own containers, remember that heaping Blackberries more than 5 inches deep will bruise the lower berries. Plastic dishpans, metal oven pans with 3 inch tall sides and large pots make good containers. I like the Glad storage containers like the one at right. There are two types of blackberries to know about: thorny and thornless! Obviously, the thornless are easier to pick, but some people claim the thorny varieties are sweeter. With the thorny plants, you want to reach into the plant in the gaps, so you don't need to touch anything but the berry you're after, avoiding the thorns. A ripe blackberry is deep black with a plump, full feel. It will pull free from the plant with only a slight tug. If the berry is red or purple, it's not ripe yet. Repeat these operations using both hands until each holds 3 or 4 berries.Unlike strawberries, blackberries are usually pretty tough, I dump mine into the bucket. Repeat the picking process with both hands. Pick only the berries that are fully black. Reach in between the stems to grab for hidden berries ready for harvest. Bend down and look up into the plant and you'll find loads of berries that other people missed! 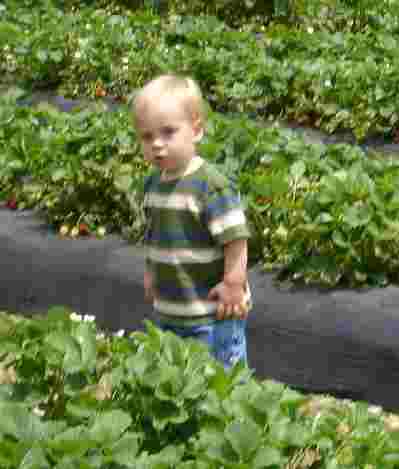 Avoid placing the picked berries in the sunlight any longer than necessary. It is better to put them in the shade of a tree or shed than in the car trunk or on the car seat. Cool them as soon as possible after picking. Blackberries may be kept fresh in the refrigerator for up to a week, depending upon the initial quality of the berry. After a few days in storage, however, the fruit loses its bright color and fresh flavor and tends to shrivel. Put a couple of days supply into the fridge, wash off the others, drain them and freeze them up! (Unless you're going to make jam right away) Blackberries are less perishable than blueberries or strawberries, but refrigerate them as soon as possible after picking. Temperatures between 34 F and 38 F are best, but, be careful not to freeze the blackberries (while they are in the fridge)! How to make Blackberry jam - It is VERY easy - especially with our free Blackberry jam directions - very easy! Blackberry syrup, make and can it! Just rinse them in cold water. I use a large bowl filled with water, pour the berries in, and gently stir them with my fingers to dislodge any dirt or bugs. Then using my fingers like a sieve, I scoop the blackberries out of the water, and put them in a drainer to let the water drain off. Then I just pour the berries into a ziploc bags or vacuum sealer bags and pop them in the freezer. After they are frozen, I remove as much air from the bag as possible and seal the bags. Soaking in Salt Water? Sinkers or Floaters? I planted 7 Blackberry bushes 2 years ago and am now in the midst of a lot of ripening berries. Therefor...I'm making jam (along with pies and cobblers). A friend told me that before I eat or cook with them, I should soak the freshly picked berries in the sink full of slightly warm water and a full Tablespoon of salt to remove any parasites (small worms). Have you ever heard of this? Do you know of specific directions to insure all the worms are removed? I've just been rinsing them and using them for the past couple of days. Also, the same friend said that if the berries floated in the water they were "good", but that if they sank to the bottom of the sink I should throw them out. What are your thoughts? Answer: Well, soaking in salt water sometimes (but now always) causes grubs to dislodge. BUT. in 30 years of growing blackberries in 12 states and 2 continents. I've never seen a bug in a blackberry. But I have heard of folks who do have a problem with pests. If you see bugs in there, give it a try. But until then, save yourself trouble and just wash them in a large bowl of cold water! Floaters v. sinkers? Naaaahhhh! I've never heard that the density of the berry was a consistent indicator of much other than weather conditions. 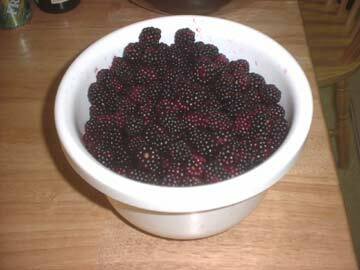 I have picked my blackberries and have seen little worms. Not sure if these are fruit flys that have laid eggs in them - or if they are grubs. I picked some out than froze the berries. I have heard that cold will kill them or drawn them out. If I make jam the cooked way (not freezer jam) and some of the grubs/worms are left will it hurt people? I would like to believe I got them all but fear I did not. Answer: That sounds like some type of fruitworm, the grub or larval form of a beetle. Typically, they are about 1/4-inch long. Soaking for an hour or more in salt water (1 cup of slat to the gallon), may help draw them out. Cold would probably kill them, but leave them inside the fruit. I don't imagine they would be harmful if cooked into jam... but I doubt anyone would ask for seconds if they found one. Eeeewwwwww!